No more guessing letter by letter. No more messy stickers that come off or fade. An inexpensive and elegant solution for entering occasional Hebrew words and phrases or typing full documents. 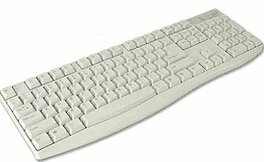 The English-Heberw Keyboard is a high-quality standard English keyboard with the Hebrew alef-bet on the keys in addition to the English letters. The keyboard attaches to any PC computer with a regular PS2 keyboard port and with an adapter to a PC computer with an AT port. The keyboard is compatible with all English and Hebrew software.